Background A case of metastatic carcinoma secondary to urothelial carcinoma presenting as musculoskeletal pain is reported. A brief review of urothelial and metastatic carcinoma including clinical presentation, diagnostic testing, treatment and chiropractic considerations is discussed. Case presentation This patient presented in November 2014 with progressive neck, thorax and upper extremity pain. Computed tomography revealed a destructive soft tissue mass in the cervical spine and additional lytic lesion of the 1st rib. Prompt referral was made for surgical consultation and medical management. Conclusion Distant metastasis is rare, but can present as a musculoskeletal complaint. History of carcinoma should alert the treating chiropractic physician to potential for serious disease processes. Neck pain accounts for 24% of all disorders seen by chiropractors. Although infrequently encountered, malignancy and infiltrative processes are a potential pathological source of neck pain. Cancer is among the most common life threatening conditions presenting to chiropractic treatment facilities, with 58.9% of chiropractors self-reporting identification of previously undiagnosed carcinomas. A recent systematic review identified more than 60 published cases of diverse cancers recognized by chiropractic physicians. The objective of this case report is to describe a patient presenting for chiropractic care with neck, arm and thorax pain due to metastatic disease secondary to urothelial carcinoma and provide brief review including clinical presentation, diagnosis, and treatment. An 81-year-old white male presented to the Saint Louis Veterans Health Affairs chiropractic clinic in November 2014 with a referral for low back pain and he described additional complaints of neck pain, upper thoracic pain, radiating numbness, tingling and pain into the left arm, and pain that radiated into his left lateral and anterior chest wall. Coughing and sneezing significantly increased his pain in all areas of complaint and he denied chest pain and shortness of breath. Relevant medical history included concurrent care for high-grade papillary transitional cell carcinoma (TCC) of the bladder, and presence of a pacemaker. He was a 50-year non-smoker, but with a 30-pack year history of cigarette use. His bladder cancer was diagnosed approximately one year prior after he presented with gross hematuria. Cystoscopy confirmed the presence of an 8 mm papillary tumor near the right ureteral opening and trigone, and a second cystoscopy identified a 5 mm mass on the left lateral bladder wall. Two prior biopsy and transurethral resections of bladder tumor (TURBT) procedures had been performed. Pathology report revealed high-grade transitional cell carcinoma that invaded subepithelial connective tissue, but was negative for muscular infiltration. Upon presenting for chiropractic care he was in the process of completing a second round of Bacillus Calmette-Guérin (BCG) immunotherapy. 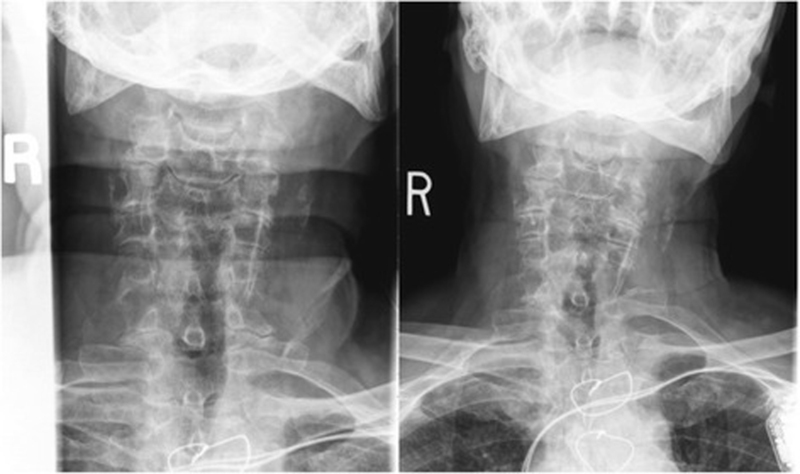 Cervical radiographs taken one week prior to presentation were read as moderate degenerative changes of the cervical spine with moderate carotid bulb atherosclerosis (Figure 1). Physical examination revealed tenderness to touch of cervical paraspinal muscles and left upper trapezius, and diminished light touch of the left upper extremity. Left anterior chest wall pain was reproduced with manual over pressure of the left lower cervical spine. The provider could not clearly identify the cause of the upper back, chest and arm pain and did not provide any treatment to the cervical region. MRI was contraindicated due to the presence of an implanted pacemaker. Computed tomography was obtained; multiplanar multidetector CT images revealed a large destructive soft tissue mass along the leftward aspect of C6-T1 with frank osseous destruction of the vertebral bodies and transverse processes (Figure 2). An additional lytic lesion was identified within the first right rib (Figure 3). The patient was sent to the emergency department for stabilization and consultation with an orthopedic surgeon. He selected non-operative management and was stabilized with a Miami-J cervical collar. The patient expired 4-weeks following the discovery of these lesions on the CT scan. Metastatic disease of the cervical spine can present with a variety of clinical signs and symptoms; including mechanical, nonmechanical, and referred pain due to pathologic fracture and/or neurologic dysfunction from cord or nerve root compression. Localized nonmechanical pain is the most common complaint, and is often described as not being related to any activities, progressively worsening, and exacerbated in the evening. For patients with a history of carcinoma and a new onset of nonmechanical pain it is imperative to rule out the presence of metastatic disease. [17-19] Our patient’s history of UC, cigarette use, and new onset of neck pain was a red flag for potential pathologic processes. There is a clear correlation between smoking and the risk of developing bladder carcinomas. Cigarette smoking is credited as responsible for more than 50% of cases within the developed world , and a four to seven times greater risk than nonsmokers. [22, 23] An additional 5 to 10% of cases can be linked to occupational exposures, such as aromatic amines used in manufacturing of chemical dyes and pharmaceuticals, and in gas treatment plants. [24, 25] While our patient was a long-term non-smoker his prior smoking may still have been contributory to disease development. Patients with a known history of cancer presenting with persistent neck pain (including mechanical and nonmechanical) should be evaluated for pathologic processes. A history of nocturnal pain further escalates the suspicion of a neoplastic process. Early diagnosis can be aided with basic neurologic screening for spasticity, hyperreflexia, Hoffman sign, and abnormal plantar reflexes. In our case, the patient presented with vague mechanical symptoms and neurological symptoms that quickly progressed between visits—although pathologic reflexes remained absent. Evaluation for metastatic disease includes common laboratory tests such as complete blood count, blood chemistry tests, liver function tests, chest radiography, and CT or MRI. Follow-up bone scan may be performed if in the presence of symptoms indicating potential bone metastasis or elevated alkaline phosphatase levels . Men have a higher incidence of spinal metastases than women, and individuals in the fourth and sixth decade are most likely to be affected. The main mechanisms by which a lesion can metastasize to the spine are dependent on the primary neoplasm and include: direct extension or invasion, hematogenous metastasis, and cerebrospinal fluid (CSF) seeding. Direct extension occurs through primary lesions becoming locally aggressive and extending to involve bony spine. Hematogenous seeding is facilitated by the vast arterial supply of the vertebra and via the valveless venous drainage plexi such as Batson’s plexus. Seeding of a primary lesion through the CSF occurs much less frequently and is most often caused by surgical manipulation of cerebral lesions. Post-mortem biopsy was not performed on this patient, therefore it is not possible to definitively state that his cervical metastasis was a direct result of his urinary carcinoma. Management of metastatic disease of cervical spine requires a multidisciplinary approach. In general, nonsurgical management of metastatic spine is recommended when tumor involvement has not resulted in spinal instability, neurological involvement, and pain nonresponsive to medical management. Nonoperative management consists of radiotherapy, chemotherapy, hormonal therapy, and high-dose steroid therapy. Radiotherapy is specifically aimed to reduce tumor size and response to therapy varies widely depending on tumor type. To reduce localized intramedually edema, acutely presenting symptoms of cervical epidural spinal cord compression by a neoplasm can be managed with corticosteroids such as Dexamethosone. Chemotherapy may be utilized as an adjuvant therapy to treat the primary tumor(s), as it has no direct effect on spinal instability. Although not a primary method of treatment, bisphosphonate use in the setting of metastatic cervical spine disease is advocated to reduce the incidence of skeletal-related events such as pathologic vertebral fractures and cord compression. Surgery is generally palliative and indicated in cases of neurologic dysfunction, spinal instability, and intractable pain (Table 1). In cases of metastatic tumor the most common surgical intervention is anterior cervical corpectomy with fusion. Laminectomy with fusion is used less frequently as most lesions are located anteriorly. However, posterior decompression and stabilization may be the best treatment option at the craniocervical junction. Detailed discussion of each individual therapy is beyond the scope of this paper and can be found elsewhere [8, 36, 37] (Table 2). The effectiveness of these treatment modalities and the patient survival rate depends on the histological tumor type, tumor stage, therapeutic control of the primary tumor, and spread of the tumor. Indications for treatment are guided not simply by neurocompression, but also by quality of life factors—such as pain and loss of mobility. The oncology clinical decision process is further hampered, as a surgical option is often inappropriate due to possible comorbidities. One of three cancer patients experience pain either directly related to their lesion or as an adverse result of cancer treatment—for instance radiation related fibrosis and joint contracture or chemotherapy-induced neuropathy. Chiropractic care with high-velocity manipulation is widely considered an absolute contraindication. Potential diminished bone strength and integrity from malignancy puts the patient at risk of skeletal-related events with forceful treatments. Low force treatment techniques such as mechanical-assisted manipulation methods , myofascial release, stretching and gentle exercise may be appropriate on a case by case basis as an adjuvant for pain management. While prudent use of chiropractic services in cancer patients may offer effective strategies for reducing the pain and suffering, we do not believe that any chiropractic care was appropriate for our patient’s chief complaint. Written informed consent could not be obtained. The Saint Louis Veterans Health Affairs privacy officer and Research Development Committee provided approval for publication of this report and associated images. A written approval is available for review by the Editor-in-Chief of this journal. This case describes the presentation of metastatic urothelial carcinoma as a source of neck, arm and thorax pain. Development of urothelial carcinoma is strongly correlated with smoking and occupational exposures. Although distant metastasis is rare, it can present as musculoskeletal pain and it is not uncommon for previously undiagnosed cases to present to chiropractic physicians. This article is distributed under the terms of the Creative Commons Attribution 4.0 International License (http://?creativecommons.?org/?licenses/?by/?4.?0/? ), which permits unrestricted use, distribution, and reproduction in any medium, provided you give appropriate credit to the original author(s) and the source, provide a link to the Creative Commons license, and indicate if changes were made. The Creative Commons Public Domain Dedication waiver (http://?creativecommons.?org/?publicdomain/?zero/?1.?0/?) applies to the data made available in this article, unless otherwise stated. CJD performed the literature review, and prepared the manuscript. PJW assisted in preparation of the manuscript. GAB cared for the patient and provided editorial review. All authors’ read and approved the final manuscript. The views expressed in this article are those of the authors and do not reflect the official policy or position of the Department of Veterans Affairs. This material is the result of work supported with resources and the use of facilities at VA St. Louis Health Care System. Recent developments in the pathophysiology of bladder cancer. Weizer AZ, Shariat SF, Haddad JL, Escudier S, Lerner SP. Metastatic Transitional Cell Carcinoma of the Urinary Bladder to the Shoulder Girdle. Shinagare AB, Nikhil HR, Jagannathan JP, Fennessy FM, Taplin ME, Van den Abbeele AD. Metastatic pattern of bladder cancer: Correlation with the characteristics of the primary tumor. Jemal A, Murray T, Ward E, et al. Cancer statistics, 2005 [published correction appears in CA Cancer J Clin 2005;55(4):259]. CA Cancer J Clin. 2005;55(1):10–30. Semino MA, Cabria RO, Garcia EC, Banez ET, Alonso A, Rodriguez FV. Distal bone metastases from carcinoma transitional cell bladder. Sengelov L, Kamby C, Maase H.
Pattern of metastases in relation to characteristics of primary tumor and treatment in patients with disseminated urothelial carcinoma. Fehlings MG, David KS, Vialle L, et al. Decision making in the surgical treatment of cervical spine metastases. Spine (Phila Pa 1976). 2009;34 Suppl 22:S108–17. Talbot JN, Paycha F, Balogova S.
Diagnosis of bone metastasis: recent comparative studies of imaging modalities. Q J Nucl Med Mol Imaging. 2011;55:374–410. Ehdaie B, Shariat SF, Savage C, Coleman J, Dalbagni G.
Postoperative nomogram for disease recurrence and cancer-specific death for upper tract urothelial carcinoma: comparison to American Joint Committee on Cancer staging classification. Pollack A, Zagars GK, Cole CJ, et al. The relationship of local control to distant metastasis in muscle invasive bladder cancer. Patients using chiropractors in North America: Who are they, and why are they in chiropractic care? An approach to neck pain for the family physician. Daniel DM, Ndetan H, Rupert RL, Martinez D.
Self-reported recognition of undiagnosed life threatening conditions in chiropractic practice: a random survey. The chiropractic care of patients with cancer: A systematic review of the literature. Molina CA, Gokaslan ZL, Sciubba DM. Diagnosis and management of metastatic cervical spine tumors. Orthop Clin N Am. 2012;43:75–87. Sciubba DM, Petteys RJ, Dekutoski MB, et al. Diagnosis and management of metastatic spine disease. Metastatic tumors of the spine. Tumors of the Spine. In: Sundraresan N, Schmidek H, Schiller A, editors. Diagnosis and Clinical Managemen. Philadelphia: WB Saunders; 1990. Sundaresan N, Boriani S, Rothman A, et al. Tumors of the osseous spine. Sharma S, Ksheersagar P, Sharma P.
Diagnosis and treatment of bladder cancer. Risk factors for bladder cancer. Advances in the etiology of urothelial cancer. Urol Clin North Am. 1984;11(4):557–66. Burch JD, Rohan TE, Howe GR, et al. Risk of bladder cancer by source and type of tobacco exposure: a case–control study. Bladder cancer following low or high dose pelvic irradiation. Lin J, Spitz MR, Dinney CP, Etzel CJ, Grossman HB, Wu X.
Bladder cancer risk as modified by family history and smoking. Transitional cell carcinoma of the ureter in a patient with buttock pain: A case report. Arch Phys Med Rehabil. 2008;89:150–2. Raitanen M-P, Aine R, Rintala E, et al. Finn Bladder Group. Differences between local and review urinary cytology and diagnosis of bladder cancer. An interobserver multicenter analysis. Diagnosis of urothelial carcinoma from urine. Mod Pathol. 2009;22 Suppl 2:S53–9. Lokeshwar VB, Habuchi T, Grossman HB, et al. Bladder tumour markers beyond cytology: international consensus panel on bladder tumour markers. Mohr DN, Offord KP, Owen RA, Melton III LJ. Asymptomatic microhematuria and urologic disease. A population-based study. Greene FL, Page DL, Fleming ID, editors. Urinary bladder, AJCC Cancer Staging Manual. 6th ed. New York: Springer-Verlag; 2002. p. 335–40. In: Norden AD, Reardon AD, Wen PC, editors. Primary Central Nervous System Tumors: Pathogenesis and Therapy. New York, NY: Humana Press. 2011;529. Arguello F, Baggs RB, Duerst RE, et al. Pathogenesis of vertebral metastasis and epidural spinal cord compression. Mazel C, Balabaud L, Bennis S, et al. Cervical and thoracic spine tumor management: surgical indications, techniques, and outcomes. Orthop Clin North Am. 2009;40(1):75–92. vi–vii. Spinal metastasis in the elderly. Eur Spine J. 2003;12 Suppl 2:S202–13. Mesfin A, Buchowski JM, Gokaslan ZL, Bird JE. Management of metastatic cervical spine tumors. J Am Acad Orthop Surg. 2015;23(1):38–46. Alternatives in cancer pain treatment: The application of chiropractic care. The chiropractor’s role in pain management for oncology patients. J Manipulative Physiol Ther. 2001;24(1):52–7. Schneider M, Haas M, Glick R, Stevans J, Landsittel D.
Spine (Phila Pa 1976). 2015;40(4):209–17.